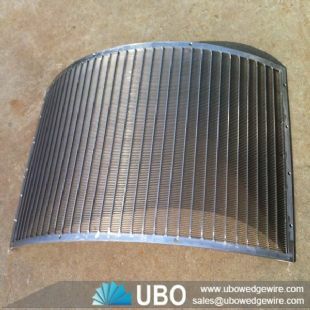 Stainless steel wedge mesh filter features: 1. Easy to leak, wear-resistant, corrosion-resistant, the mesh section is trapezoidal, the gap is narrow and wide. 2. Good wear resistance and long service life. Due to the unique and superior materials used in this product, the structural design is more perfect. Its service life is more than double that of domestic similar products. 3. The maintenance workload is small. 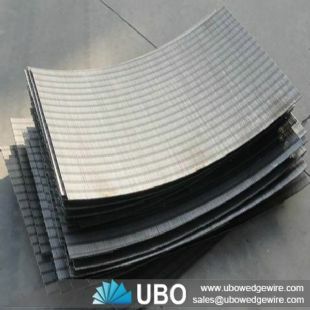 The high-strength coal-washing arc-shaped sieve plate has a reasonable structure, is not easy to be damaged, and has an extremely long service life, thereby greatly reducing the maintenance and maintenance loss. 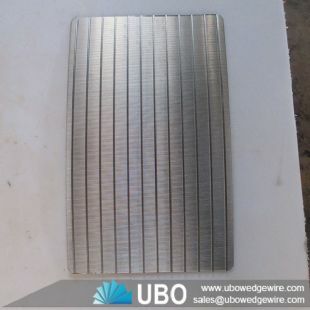 UBO factory has very advanced looms and welding equipment, strong technical force, scientific process, perfect quality inspection system, high quality raw materials, strict quality control, complete product specifications, coal washing sieve plate is the sieve plate specification used in coal washing industry. In general terms, coal washing screens play a vital role in enterprises such as coal washing plants. The quality of the screens determines the quality of the products produced and the production efficiency. The coal washing screens can be roughly divided into coal-washing screens and weaving machines. There are three types of perforated sieve plates and steel plate perforated sieve plates, among which the use of slotted sieve sieve plates is very extensive. The slotted sieve plate is welded by high-quality stainless steel trapezoidal wire. The trapezoidal wire has high strength and high wear resistance, and the screen joint is welded evenly and firmly.